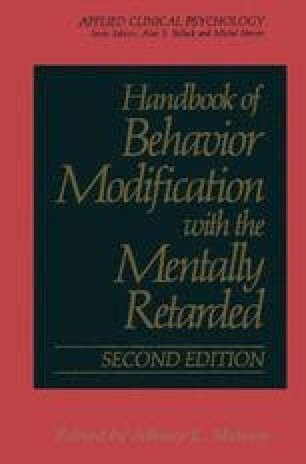 The field of behavior modification, or applied behavior analysis, is distinguished from other approaches in several ways. The fundamental characteristics and properties of the behavioral approach were identified in an article appearing in the first issue of the Journal of Applied Behavior Analysis (Baer, Wolf, & Risley, 1968). One set of properties identified in this landmark article was the methodological requirements of applied behavior analysis. The methodology was characterized by four unique requirements. The empirical focus was on observable behavior, or rate of response, in contrast to inferred states of feelings. Second, the analytical orientation involving the experimental analysis of functional relationships between variables was the primary focus of research. Third, the utilization of within-subject analyses, controlling experimentally for potential confounding variables (in contrast to statistical control), was the preferred method of studying human behavior. Finally, the applied component of the field dictated that socially relevant problems be the subject of research, and that effective technologies be developed which produce practically significant changes in behavior (Kazdin, 1977; Wolf, 1978).